Judges often used to wear gloves as a symbol that their hands were unsullied by the criminals they had jurisdiction over. Gloves “lined” with money were famous as formal bribes and judges and other high up members of society often received far too many pairs of gloves to use them all; for this reason, many fine specimens survive. These are often highly decorative, with gold braid, embroidery and sumptuous beading, as in this example. The poorer gloves, such as the ones Ella is given, that would be worn for warmth, rarely survive. 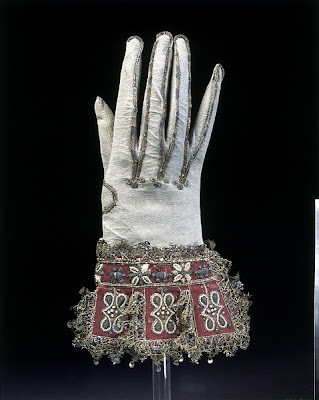 In the 16th and 17th centuries so much etiquette developed around them that men’s gloves in particular grew wider and more decorative as they were so often carried rather than worn. It was taboo to offer to shake a hand wearing gloves, or to accept a gift in a glove. Nor was it acceptable to remove them with the teeth. Approaching an altar in Church, men had to remove their gloves, and the right glove had to be removed when coming into the presence of a social superior as a mark of respect. The keeping on of your gloves indicated that you retained power by declining physical contact, whereas the removal meant you deferred to a higher position. Gloves were also to be put off when playing cards (to deter cheating, I suppose) or when eating.